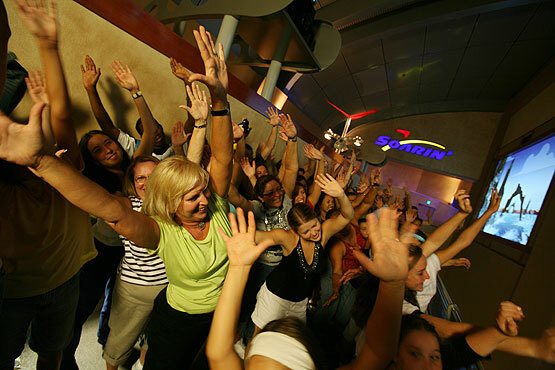 Soarin is the most popular ride in the entire Walt Disney World theme park. So popular, in fact, that at peak season, the waiting line exceeds 2 hours... of waiting in a hallway for the thrill of an 8 minute ride experience. 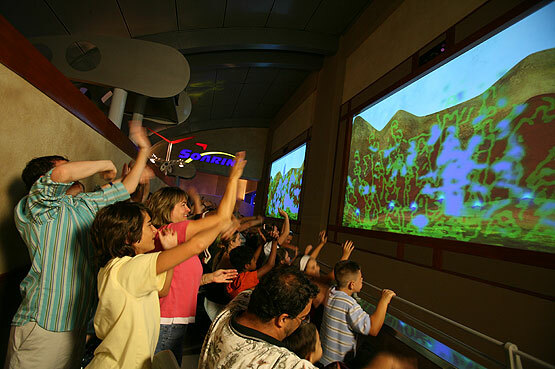 PlayMotion was tasked to transform this dull waiting time into an interactive experience in 5 parts. To realise this goal, 5 massive digital projection screens were installed along the length of a 150 foot long hallway, each measuring 11' high by 25' wide. 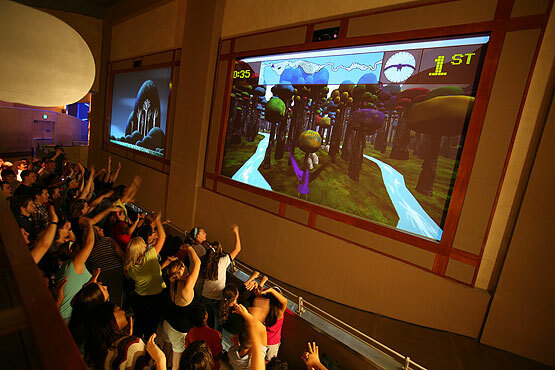 Groups of 50 people form in front of each of the screens and alternatively collaborate and compete in a series of custom interactives lasting 25 minutes in total. In all five experiences, the PlayMotion Vision Engine is employed to detect various individual gestures as well as overall crowd motion dynamics, and translate that data into input signals for a videogame, much as one would use a joystick or controller pad at home. The first experience, "Pop the Blobs," positions paint blobs on the screen, and participants are encouraged to contact and pop the blobs. Each "popped" paint blob explodes on screen and exposes an additional portion of an underlying photographic image of the park. Once each photo is fully exposed, the crowd is given an audio reward, the hot is held momentarily, and then they are advanced to the next image in the series. This experience is designed to coach guests in the basics of human motion input. In "Create", participants are presented with a nebulous landscape and sky. By using gestures to "grab" virtual handles, individuals and people working in collaboration can both elevate and depress the terraformed landscape, effectively forming mountains and valleys with their gestures. 5 planes are elevated onto the screen in rapid succession, so that in all a complete 3d mesh of landscape is formed on screen. Once the landscape is fully sculpted, the camera zooms in, and guests see seeds appearing on the land. By raising their arms in a "glory" fashion, participants are able to germinate the seeds, which then accelerate growth into algorithmically generated trees, flowers, grass and bushes. As time progresses, the crowd creates an entire plant ecosystem of their own unique creation. As the interactive concludes, the camera pans out, showing each groups relative contribution to an overall planetary landscape seamlessly spanning all five screens, a 150' wide virtual window into the Living Landscape. To balance the collaborative nature of "Create", we built a head to head competitive game dubbed "Air Race". In this game, each group of 50 guests, by leaning either to the left or the right, guides their own bird through a complex obstacle course of forests and canyons. All five birds are visible on all screens at once, so the cheers are loud as one bird pulls ahead, and the screams are wild as birds accidentally collide into the obstacles along the course. 4 complete environments were built for the gamespace (arctic, desert, forest, and nighttime) to give each run through the queue line a fresh feel. Prior to the installation of Living Landscapes, Soarin was hands down the most popular ride in the park already, with 65% of guests rating it a 10 our of 10 stars in exit surveys. Post-installation, without modification to the main ride at all, 81% of guests rated the ride 10 out of 10. And to our team, the thousands of cheers and smiles heard during testing and tuning said it all. A group steers their bird carefully through the deep forest. Individuals push and pull the earth to form mountains and valleys in real time. 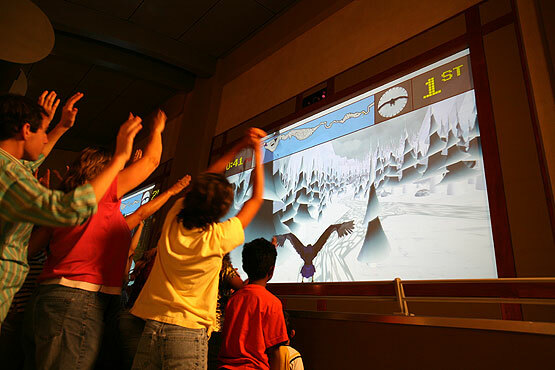 A group navigates their bird through the Arctic level of Air Race at Soarin. The smiles abound as a group narrowly avoids a falling tree in the Soarin queue line.